The emerging merchant shipping industry and related services could represent a potential new economic driving force for the Faroe Islands with the FAS ship registry playing a leading part, according to the Faroese Maritime Authority. Although Faroese exports still largely consist of fishery and aquaculture products, merchant shipping is expected to grow significantly in the years ahead. 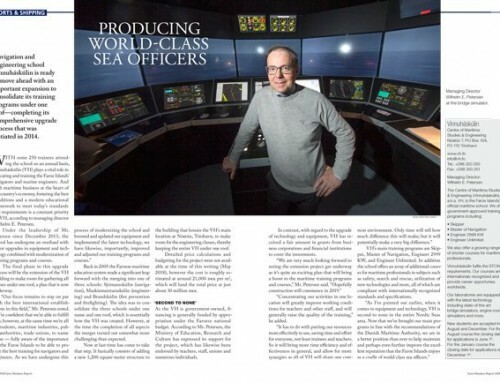 About one-tenth of the entire Faroese workforce are marine engineers and navigators while, for example, a significant percentage of the ship’s officers in the Danish merchant fleet are Faroese, with thousands of Faroese working on fishing vessels, offshore support vessels, tankers and freighters around the world. Against this backdrop the FAS — the Faroe Islands International Ship Register — was established, initially in 1991, as a way to help bolster the domestic merchant fleet. Later, in 2008 and further in 2009, the FAS was revised and redesigned to make it consistent with international demand. 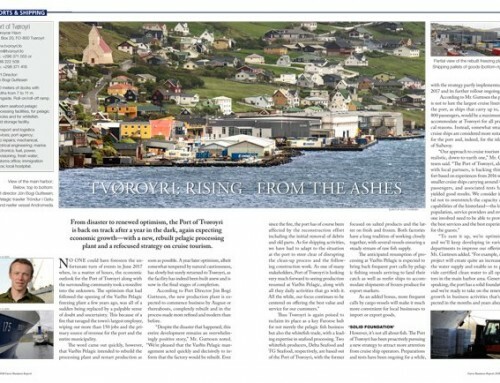 Alongside financial and fiscal considerations, the needs and requirements of international shipowners that have been noted in the Faroe Islands include recruitment opportunities and smooth dealings with public authorities, said Hans Johannes á Brúgv, Director General of the Faroese Maritime Authority (FMA). 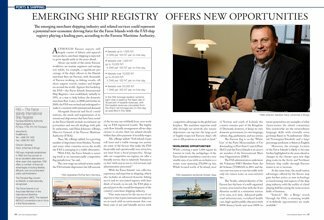 Thus, Mr. á Brúgv added, for a growing number of shipowners from Sweden, Norway and many other countries across the world, the FAS is emerging as a viable alternative. “With FAS, the Faroe Islands is asserting itself as an internationally competitive flag jurisdiction,” he said. The crew wage tax refund system under the FAS refunds shipowners the full amount of the income tax withheld from crew working on FAS-registered vessels. The highly cash-flow friendly arrangement allows shipowners to receive their tax refund already within days after payment of monthly wages. 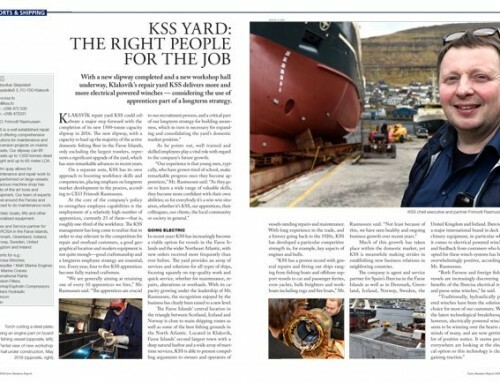 With the Faroe Islands’ vast collective experience and expertise in shipping, which also includes an advanced domestic fishing sector and its associated registry with hundreds of vessels on record, the FAS plays a pivotal part in the overall development of the country’s merchant shipping industry. While covering a mere 1,400 square kilometer in total, the archipelago of the Faroe Islands nonetheless controls a very sizable area of sea with an exclusive economic zone spanning 274,000 sq. km. While located north of Scotland, west of Norway and south of Iceland, the country remains part of the Kingdom of Denmark; however, it keeps its own domestic government, its own language, culture, flag, parliament, and tax system. The Faroese flag is on the ‘White List’ of the Paris Memorandum of Understanding on Port State Control (Paris MoU) and the Faroe Islands is an associate member of the International Maritime Organization (IMO). The FAS administration underwent the Voluntary IMO Member State Audit Scheme (VIMSAS) in 2011 and the outcome was seen as very favorable with only two minor notes on nonconformities. The Nordic cultural identity of the Faroese lays the basis of a well-organized society, structured in line with the Scandinavian model in a miniature version of its own, as it were. Advanced public road infrastructure, socialized health care, high-quality public education with 100% literacy levels and near-100% internet penetration are examples of what characterizes the island community. Also noteworthy are the extraordinary language skills with virtually every grownup fluent in ‘Scandinavian’ (Danish/Norwegian/Swedish) and a large percentage proficient or fluent in English. 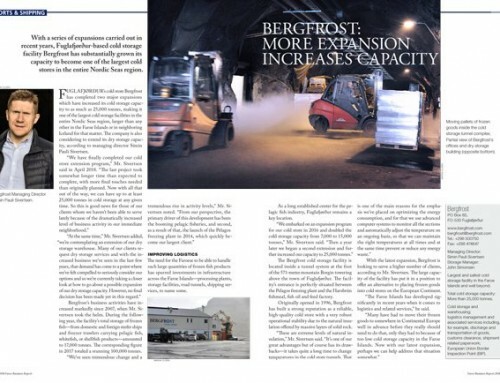 Moreover, the strategic location of the Faroe Islands is likely to become further highlighted in the years ahead as changes in the climate open new shipping routes in the Arctic and Northeast Atlantic ship traffic through Faroese waters is set to increase. 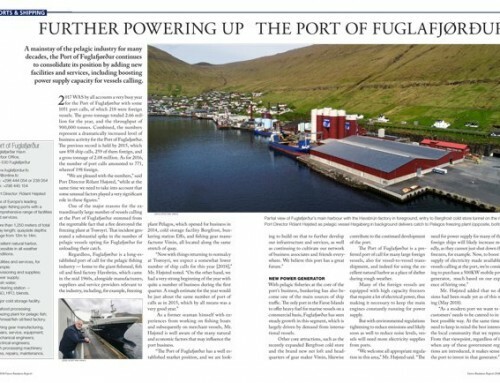 At the same time, the small-nation advantages offered by the Faroes may gain further notice as new technology is transforming vital aspects of the shipping industry, with the reality of a level playing field becoming the norm in most fields of business.